When choosing the cabbage, make sure it is a firm head and has crisp and shiny leaves (a). Then, you cut the cores out (b); third, you can either shred cabbage leaves into strips or hand peel them into smaller pieces. Once you are done, place them into a bowl (c). The next step is to decide how much salt you want to add (d). Once again, this is based on your understanding that: A) everyone should keep their sodium intake in check; B) about 1.5% of salt per pound of vegetables is ideal for kraut making; and C) the salt you are about to add should not weigh more than 10% of the weight of the prepared vegetable. Mix the salt into the prepared vegetables and massage with your hands and fingers for a few minutes (e), set the bowl aside, and wait for about 30 minutes until the brine is formed. 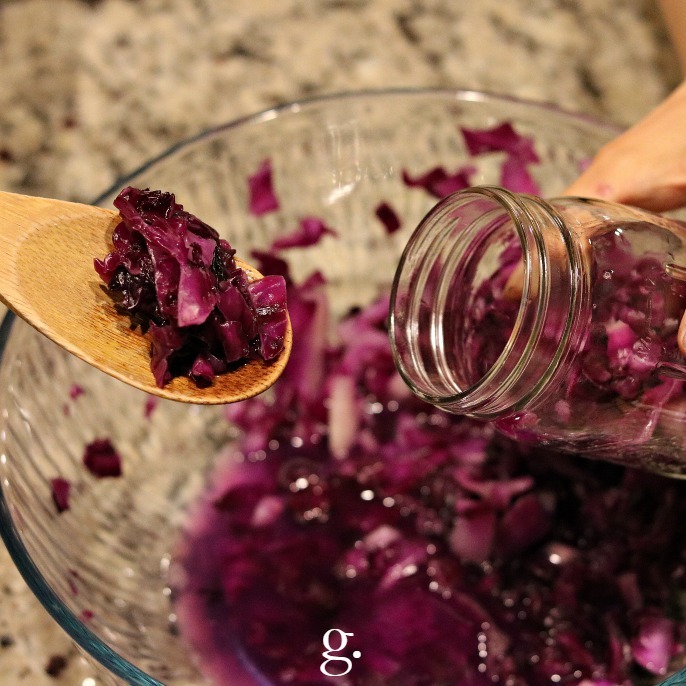 Alternatively, you can continue to massage the prepared cabbage until the brine is produced (f). 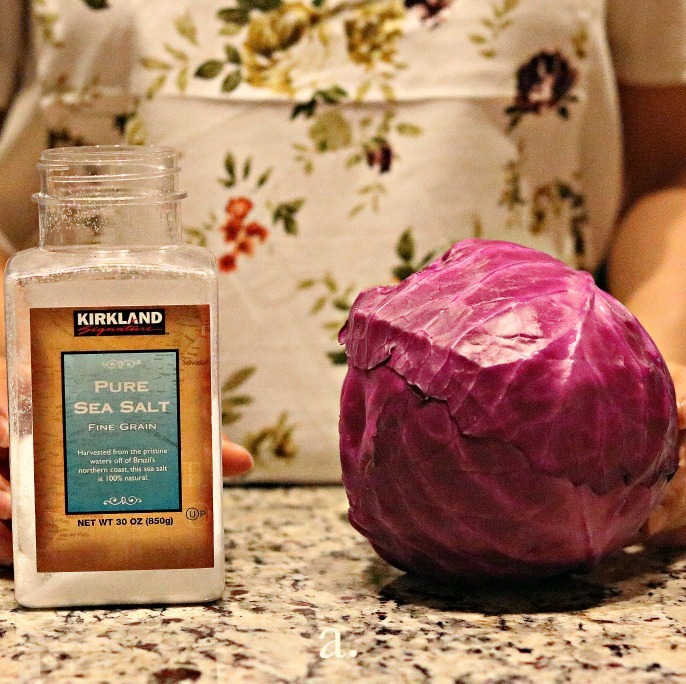 It took me about eight minutes to massage one pound of shredded cabbage (mixed with two teaspoons of sea salt) until the brine was formed. Next, pack the prepared vegetables into the jar (g) as tight as possible by either using your fingers or a tamper to press downwards. The key is to leave out the air and create an oxygen-free environment. As you firmly press against the vegetables, you will see that the brine starts to appear while the veggies are submerged underneath. Carbon dioxide will be generated as soon as the fermentation process begins (that’s why you can then start to see bubbles hidden in the veggies as early as the next day). The vegetables may expand and be exposed to the air, preventing you from a successful fermentation. That’s why it is important to add a follower or several layers of followers here right on the top of the packed veggies to keep them submerged. 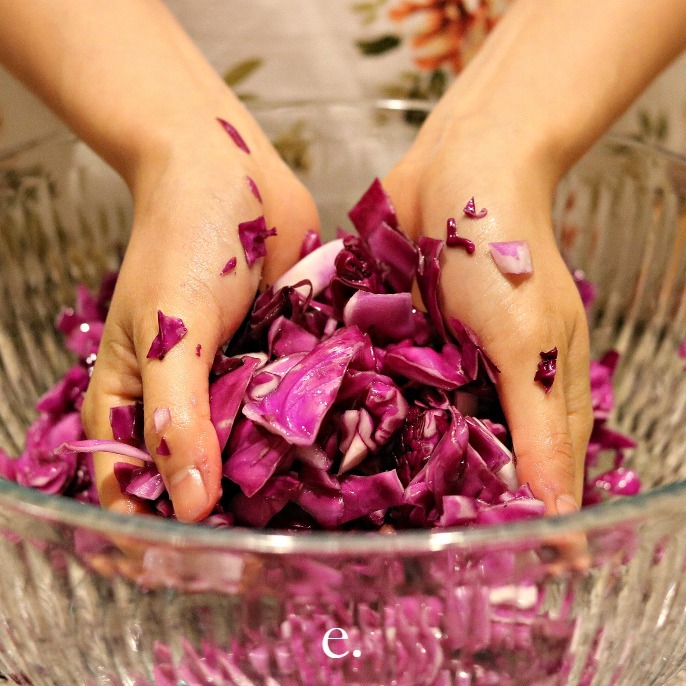 A very simple method is to save a few pieces of cabbage leaves right before you start chopping up the whole cabbage or hand peeling the cabbage leaves (h). 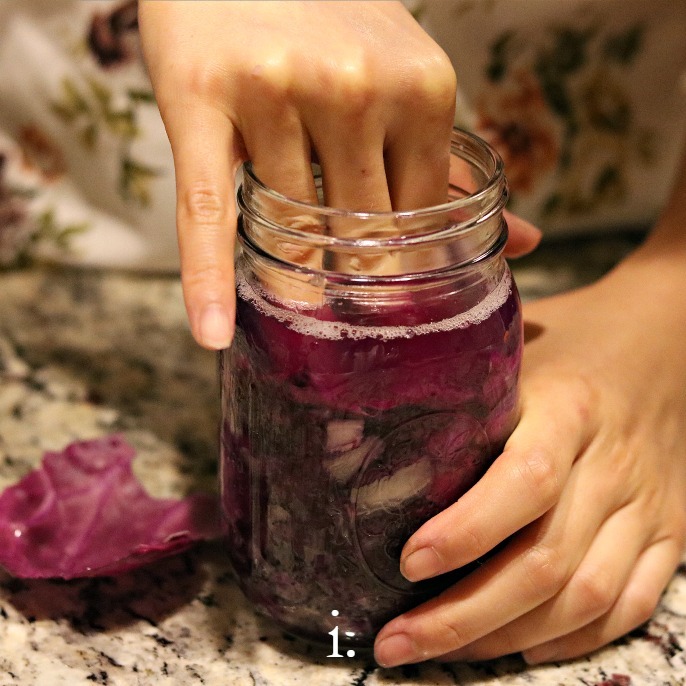 You can simply press the pieces into the mouth of the jar against the top of the shredded veggies as hard as you can (i), while making sure cabbage leaves which serve as followers are also submerged underneath the brine. Leave one to two inches between the top of the brine and the lid to avoid brine leakage and chemical reactions between the brine and the lid (j). 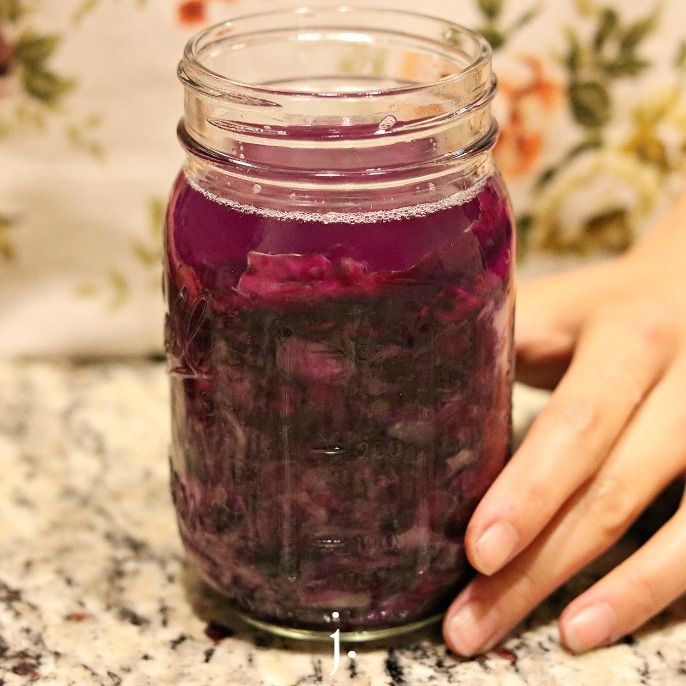 The rubbery texture of cabbage leaves help themselves cling to the jar wall, so that they “stick” to the wall and will not be easily pushed upwards after carbon dioxide is generated and escapes from the veggies underneath.